We made a national geographic about the lost civilization. Civilization needs government, like rulers, laws and punishments, economy like money trading and jobs, culture like religion, art and architecture. I am very proud of my myth page. 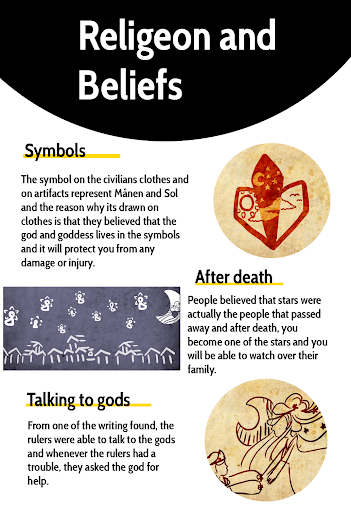 I got to be creative with this page and I got to make new myths and beliefs. I got to put many information and also I put a lot of effort in to make it look like its one of a national geographic book. Like for example I only used black, yellow and white (excluding pictures) and I used circles to outline the pictures. I am also proud of this page. I am proud of this page because the drawing I have made, I put a lot of effort in it. The drawing took me a long time to make it look realistic and old and I think this artifact is the best one I have made so far. During this project I have learnt many things about civilization like rules, jobs and trading, but also I got to learn how ancient civilization its different from ours and how much we developed.